Class: Sophomore Hometown: Cranberry Township, Pa.
NOTES: Two-year letterwinner... 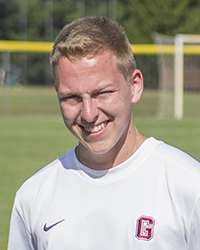 Younger brother of former men's soccer player George DeAugustino... 2015: Appeared in eight matches off the bench ... Netted first collegiate goal in win over Saint Vincent ... 2014: Appeared in 11 matches, making one start... Made first collegiate appearance against Pitt-Greensburg... Made first start in win over Hilbert.